Not everyone was around to experience the iconic NES Zapper when it was originally released in 1984, so that’s why the latest Teens React video is showcasing Nintendo’s accurate light gun and the all-time NES classic, Duck Hunt. Watch as teens come to the consensus the electronic light gun accessory is actually “pretty accurate” and that the dog is irritating as ever, and see how they gradually improve over time in 18 minutes of action. Let us know in the comments if you’ve ever had the honour of using the legendary NES Zapper or if you’ll just have to settle for the more recent Wii Zapper gun shell peripheral, a Wii Remote and a Virtual Console copy of Duck Hunt on the Wii U. "thank god its not a powerglove"
lol i love that comment. kill 2 and thinks she is good at it lol. I've never used the Wii Zapper but I have fond memories of the NES Zapper. As I grew older, my parents got rid of the NES, but I recently bought myself one from ebay with the Zapper and duck hunt game and it's just as fun as I remember. My brother who never played it during its time actually really enjoyed it. Because the way the Wii works now, he expected the NES Zapper to work well and it still does. Nintendo tech ftw. @tsukipon I had a similar experience as a child. Thankfully I was able to get hold of a Zapper, a copy of Duck Hunt and a Toploader NES about 4 years ago. Since then I've looked back! I love the game. The VC version is not as good. 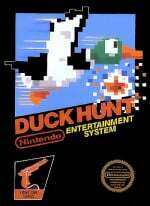 I loved Duck Hunt as a kid, picked up a old NES years back with that, Zelda and Link games. It was fun for a little bit, I was never really that good at it though, ha ha. I loved light gun games to death in the day. Probably why the Saturn is my favourite system. It's a shame the tech can't be used anymore. It just isn't the same with Wiimotes, even with gun attachments. I used to love playing this game and hearing the loud snapping noises for gunshots and seeing the screen flash white. Made me feel like a boss! Old man reacts to teens playing games: "who cares?" I think I've got a crush on Tori... But yeah, nice episode! Sometimes I wonder if the Fine Bros are doing a better job of bringing teenagers to Nintendo than Nintendo is. As an obligation, this topic needs a back in my day rant. I do miss the immediacy of the Zapper tech. How about some Gumshoe! My dad refused to get the gun because he thought it would hurt the TV. Facepalm. Had a blast with it at my friend's houses. I hate Teens React so freaking much. I usually hate Teens React videos on YouTube because it highlights how arrogant Generation Y can be in the worst of times. However, Duck Hunt to this day is still the best 'Am I sober enough to drive' test I have ever used. If I can't clear up to level 20, I stay home or call a cab. I played "Duck Hunt" like crazy as a kid, and actually got up to Level 26 once...but I usually sat close to the TV. My aim was never very good from far away. On the subject, I'd really like some more light gun games, there are so many fun, mindless shoot-anything-that-moves arcade games, current and back in the day, that I can't believe nobody tries to port them to consoles. I'd love to play operation wolf or operation.. thunderbolt i believe it was, at home. Lots of good times in the arcade from those shooting games of old, and i'd say it's a genre more neglected than side scrolling shooters (which seem to be making a comeback). Granted, I dont consider these a FPS, which there are plenty of. That squinty chick Tori's enthusiasm is infectious.